The first Saravana Bhavan was founded in 1981, and we say first here because ever since its inception, it has gone on to become the largest restaurant chain in the world for vegetarian food. This is a restaurant chain which doesn’t rely on advertising and marketing but on simple, quality food and the exemplary word-of-mouth of its customers. We decided to go see for ourselves exactly what is it that makes people, including families and tourists from all parts of the world strolling around Janpath come here and wait for hours on end to grab a meal at this vegetarian joint which has outlets at more than eighty locations worldwide (woah)! 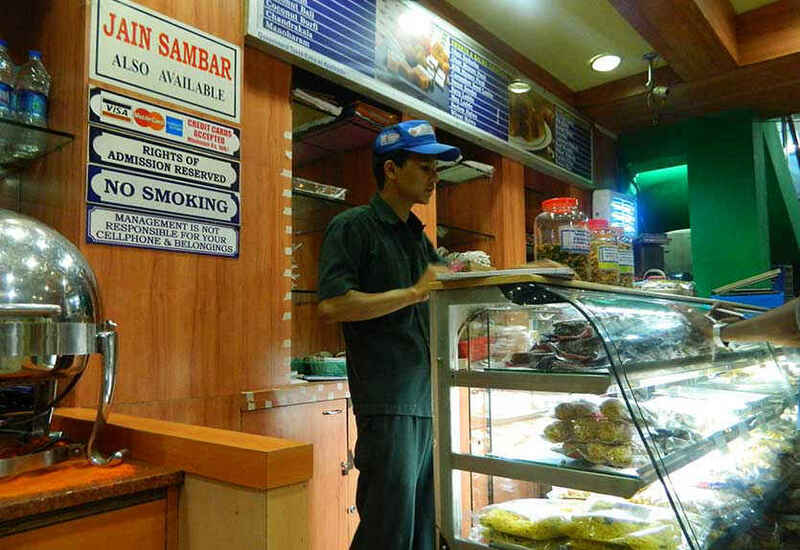 There are two Saravana Bhavans in Connaught Place, one in the inner circle, and one on Janpath road, which might be the source of some confusion. Generally, if you go on a weekend or Friday, chances are that there&apos;ll be a lot of waiting. The interiors of the restaurant are simple and unpretentious, and quite similar to restaurants found in South India. Spread out over two floors, the Janpath outlet has a good seating capacity but triple the amount of customers they can handle. 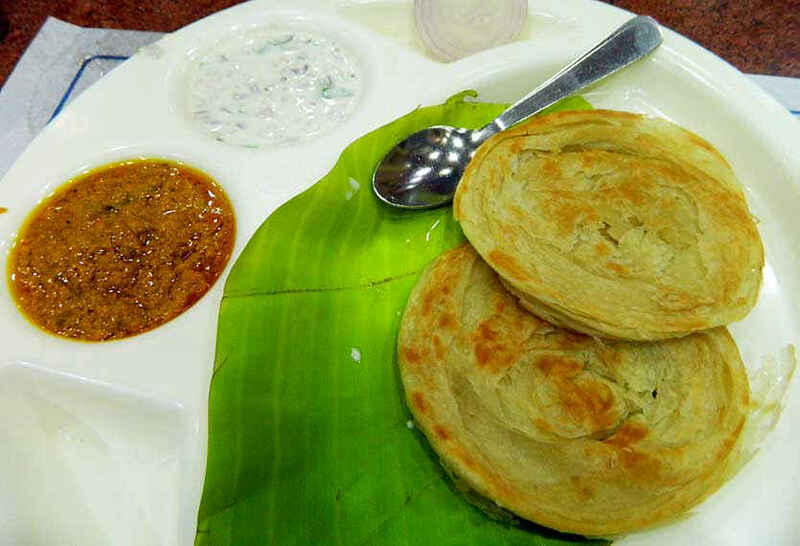 The menu is pretty much fixed, and includes an authentic, falvorful range of South Indian dishes from Dosas (called dosai), Uttapams and Vadas, Rava Khichdi and Idiyappam to their own patented sweets and ice-creams. For the first timers, the best way to get a wholesome experience here is to order their Thali, which has an assortment of South Indian vegetables plus rice, chapatis and raita. Their Thali and Rasam are available only during meal timings which are till 3 PM during the day and 7 PM onwards at night. So here&apos;s the cornucopia of dishes we tried here! First we ordered an Onion & Tomato Uttapam. Every dish here is served on a green banana leaf, and hence the golden-brown Uttapam looked quite attractive & tempting against the fresh green. 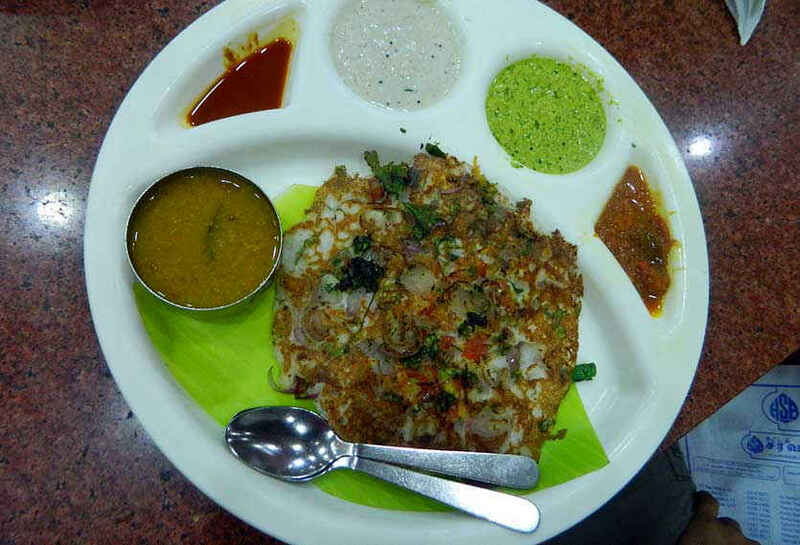 The Uttapam was thick, well-cooked and stuffed with onions and tomatoes. It tasted delicious and went especially well with the tomato chutney, which was awesome! It&apos;s also worth noting that this dish contains actual tomatoes instead of preservatives and food colouring. 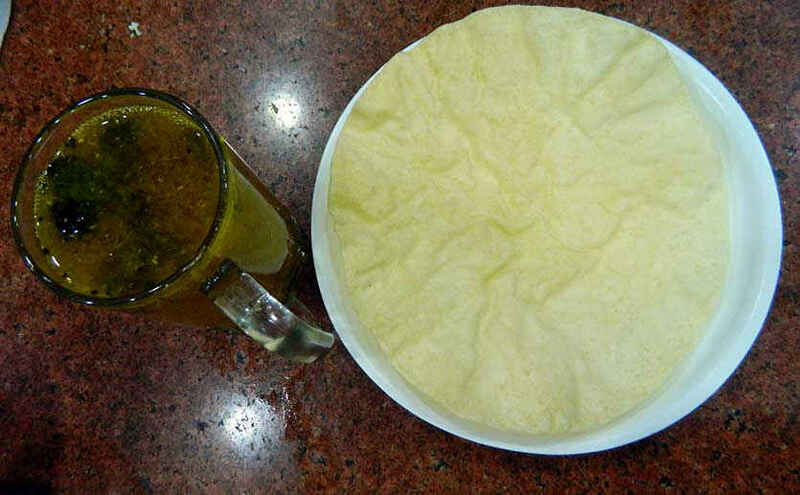 The size of the Uttapam too was quite massive, and would make for a nice evening snack. Next we ordered the South Indian Parotta. This one can totally count as a proper meal! It comprises two fat South Indian Parottas which were soft and crumbly and only slightly rubbery, however, their real genius was brought out only with the help of the accompanying Bhaji. The Bhaji was cooked perfectly, replete with all the South Indian herbs and spices added in a manner that made the taste thoroghly consistent and zesty. The third dish was their Masala Dosa, which was a slight disappointment unfortunately. The dosa, although huge, was slightly soggy, and the amount of aloo masala was not in proportion to the size of the dosa at all, and hence we had to order for extra masala, which again was chargeable. The masala, though, tasted well and had the right amount of spices. Their Coconut and Coconut-Mint Chutney went well with our dosa. The last dish on our table was their Rasam, which was served in cute beer glasses along with light papad. And just like beer, be warned, their Rasam is not for the weak hearted! Extremely hot and spicy with a sour taste, it should be sampled only after being tried and tested! The papad on the side helps dilutes the sharpness of the Rasam. It is quintessentially South Indian and hence should definitely not be missed. The sambhar at Saravana Bhavan is thicker in nature, like gravy, instead of liquidy which is unusual for a South Indian restaurant, but we personally preferred it that way. It was sour and spicy, but in a good way, and its sauciness made it easier to gobble up, as sambhar is anyway heavy on the tongue, especially for those who are not accustomed to South Indian fare. 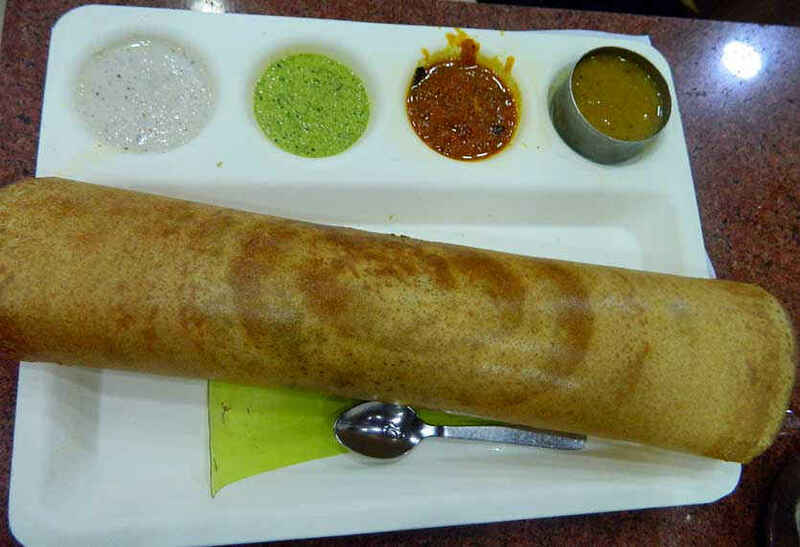 We found Saravana Bhavan&apos;s claim to foodie fame to be totally justified and were left longing for more! One can only hope that it doesn’t plunge in terms of quality, following suit to other chains, and is able to pave way for further success.